The Asheville City Building is a colorful, massive and eclectic Art Deco masterpiece. 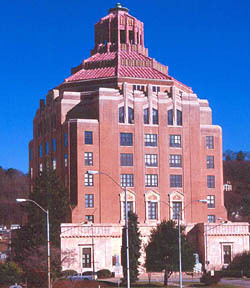 Douglas D. Ellington, an architect who came to Asheville in the mid-1920s, designed the eight-story building, which was completed in 1928. Originally proposed as part of a joint City-County Plaza development, the City Hall represents the progressive aspirations of the city in the 1920s. City officials proceeded with Ellington's design even though municipal and county officials failed to agree on a common architect and mode of design. 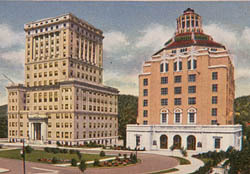 Ellington designed other Asheville landmarks including First Baptist Church, Asheville High School, and the S & W Cafeteria. Ellington stated that the design was "an evolution of the desire that the contours of the building should reflect the mountain background," referring to the amazing scenery that surrounds Asheville and serves as the backdrop of City Hall. Ellington chose building materials that presented a "transition in color paralleling the natural clay-pink shades of the local Asheville soil." The unusual octagonal roof is covered with bands of elongated triangular terra cotta red tiles. Between the two levels of the roof are angular pink Georgia marble piers between which are precise vertical rows of ornamental green and gold feather motifs. The interior of the building is designed in a manner typical of 1920s office buildings--the central core contains public elevators and an enclosed staircase while offices lie along the perimeter of each floor. The second floor houses the distinctive City Manager's Office and City Council Chambers, both decorated in Neo-Georgian fashion. The interior of the council chambers features murals by New York artist Clifford Addams that portray the story of the American Indians and early white settlers in the area. City Hall has changed little since the 1920s and still captivates residents and visitors alike with its bold and colorful style. Asheville City Hall is located at 70 Court Plaza. It houses the Office of the Mayor and other city department and is open to the public during regular business hours, 8:30am to 5:00pm, weekdays. Visitors may view City Council Chambers by making a request in the Mayor's Office at 828-259-5600 or through the city's website.